Mixed at Ardent Studios, Memphis. 'Immigrant Song' is the opening track on English rock band Led Zeppelin's third album, Led Zeppelin III, written and recorded in 1970 and released as a single. The song is memorable for its distinguishing, plaintive cry from singer Robert Plant at the commencement of the song, and is built around a recurring, staccato Jimmy Page, John Paul Jones, and John Bonham riff. The hiss at the beginning of the track is feedback building up from a recording tape echo unit. Just six days after Led Zeppelin's appearance in Reykjavik, the band publicly debuted the song for the first time during sunset at the Bath Festival, as the set opener. 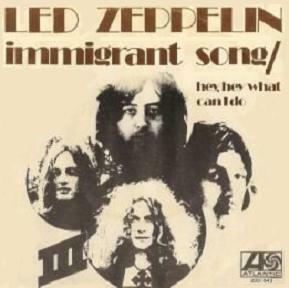 The 'Immigrant Song' is one of Led Zeppelin's few single releases, having been issued in November of 1970 by their record label, Atlantic Records, against the band's wishes. It reached Number 16 on the Billboard charts. Its B-side, 'Hey Hey What Can I Do', was unavailable on any album before the release of the band's Led Zeppelin compilation box set in 1990. The 'Immigrant Song' single was also released in Japan with 'Out on the Tiles' mistakenly as the B-side rather than 'Hey Hey What Can I Do'. This single is now a rare collectible item. One of the verses from the song became part of Led Zeppelin lore. The line, 'The hammer of the gods/will drive our ships to new lands' prompted some fans to start referring to Led Zeppelin's oeuvre as the 'Hammer of the Gods'. The 'Immigrant Song' was used as the set opener Led Zeppelin concerts from 1970 to 1972. On the second half of their 1972 concert tour of the United States, it was introduced by a prelude known as 'LA Drone', designed to heighten the sense of anticipation and expectation amongst the concert audience. By 1973, 'Immigrant Song' was occasionally being used as an encore, but was then dropped from their live set. Live performances of the song can be heard on the Led Zeppelin albums How the West Was Won (featuring a performance at Long Beach Arena in 1972) and the BBC Sessions (a version from the Paris Theatre in London in 1971). When played live, Page played an extended guitar solo, which was absent on the recorded Led Zeppelin III original. The 'Immigrant Song' was performed as part of the 2009 Rock and Roll Hall of Fame induction ceremony for Jeff Beck, by both Page (on electric 12 string guitar) and Beck (on lead guitar imitating Plants vocals). The song is also one of the few Led Zeppelin songs to have been licensed for cinematic release. For the 2003 film School of Rock, during the roadie van scene. To get permission to use this song in the motion picture, the star of the film, Jack Black, videotaped himself singing in front of 1000 extras, begging for Led Zeppelin to let them use the song in the motion picture. The song also appears, in a slightly changed version due to licensing reasons, in Shrek the Third, when Snow White attacks the city gates, guarded by Huorns. She wails the characteristic cry of Robert Plant, backed by the riff, as in the beginning of the original song.. It has also appeared on the 1999 documentary about the 1972 Munich Olympic Games massacre, One Day in September, and the trailers for the BBC1 drama series Life on Mars. 'Immigrant Song' also plays over the credits of the French TV show 50 Minutes Ins, and the Max Weinberg 7 performs this song regularly during Late Night With Conan O'Brien television show. The song is performed by marching bands at high school and college football games. Starting from the 2007 season, the Minnesota Vikings play this song during their team introductions and before kickoffs. During the 2007-2008 football season, Brentford FC played this song immediately preceding kick-off. Bruiser Brody aka Frank Goodish-professional wrestling used this song as part of his entrance music, without lyrics. ↑ Lewis, Dave (2012). Led Zeppelin: From a Whisper to a Scream. London: Omnibus Press, 41. ISBN 978-1-78038-547-1. ↑ Welch, Chris (1996). “Stairway to Heaven”, Led Zeppelin. London: Carlton Books, 55. ISBN 978-1-85868-271-6. ↑ Lewis, Dave and Pallett, Simon (2005). Led Zeppelin: The Concert File, Revised. London: Omnibus Press, 111. ISBN 978-1-84449-659-4. ↑ Billboard (January 1971). "Billboard Hot 100 Singles". Billboard 83 (5): 64. ISSN 0006-2510. Retrieved on 2009-06-05. ↑ Williamson, Nigel (2014). “The Music: 50 Great Led Zeppelin Tracks”, The Dead Straight Guide to Led Zeppelin. London: Red Planet Publishing, 218. ISBN 978-1-9059-5952-5. ↑ Jimmy Page Honors Jeff Beck at Rock Hall of Fame. Billboard. Retrieved on 2009-04-20. ↑ School of Rock (2003). Turner Classic Movies. Turner Entertainment. Retrieved on 18 October 2013. ↑ Shrek the Third (2007). Turner Classic Movies. Turner Entertainment. Retrieved on 18 October 2013. ↑ One Day in September (2000). Turner Classic Movies. Turner Entertainment. Retrieved on 18 October 2013. ↑ Top 100 Singles - 9 January 1971. Cash Box. Retrieved on 2009-01-19. ↑ Discografica Internationale (January 1971). "Hits of the World". Billboard 83 (2): 81. ISSN 0006-2510. Retrieved on 2009-06-05. ↑ Top 40 for 1971 - January 1971. Record World. Retrieved on 2009-01-19. ↑ CHUM Singles Chart - 23 January 1971. 1050chum.com. Retrieved on 2009-01-19. ↑ RPM Singles Chart - 23 January 1971. RPM. Retrieved on 2009-01-19. ↑ Top 100 Singles - 6 February 1971. dutchcharts.nl. Retrieved on 2009-01-19. ↑ Top 20 Singles - 26 February 1971. rock.co.za. Retrieved on 2009-01-19. ↑ Top 60 Singles - 6 March 1971. Go Set. Retrieved on 2009-01-19. ↑ Music Labs (March 1971). "Hits of the World". Billboard 83 (11): 56. ISSN 0006-2510. Retrieved on 2009-06-05. ↑ Top 100 Singles - 5 April 1971. musicline.de. Retrieved on 2009-01-19. ↑ Top 100 Singles - 9 April 1971. hitparade.ch. Retrieved on 2009-01-19. ↑ Radio Malaysia (May 1971). "Hits of the World". Billboard 83 (18): 69. ISSN 0006-2510. Retrieved on 2009-06-05. ↑ Top 100 Singles - 15 May 1971. austriancharts.at. Retrieved on 2009-01-19. ↑ Scapolo, Dean (2007). “Top 50 Singles - May 1971”, The Complete New Zealand Music Charts. Wellington: Transpress. ISBN 978-1-877443-00-8. ↑ Top 100 Singles - May 1971. PROMUSICAE. Retrieved on 2009-01-19. ↑ Top 75 Singles - 18 November 2007. musicvf.com. Retrieved on 2009-01-17. ↑ Hot Digital Songs - 1 December 2007. Billboard. Retrieved on 2009-01-17. ↑ Hot Digital Singles - 1 December 2007. Billboard. Retrieved on 2009-01-17. This page was last modified 08:39, 11 June 2015.